FeastHome – Brown is a natural and neutral color that is able to bring a warm atmosphere to your kitchen. 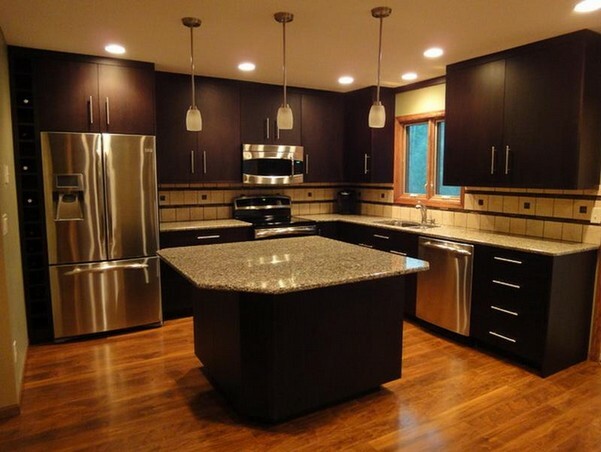 Do not be worried about your kitchen will be looked dark because brown is available in a lot of tones. Moreover, you can also combine this color with many other colors. Looking for some ideas of a brown kitchen? Check these ideas below to find your inspirations. The dim lights reflect the light to the stainless steel refrigerator, marble kitchen table, and even to the wooden kitchen floor. The reflection makes this area looks very elegant. For you who admire an elegant and fancy look, you can apply this idea for your kitchen. The householders use 2 tones of brown, the dark tone for the kitchen cabinets and light tone for the kitchen floor. Making this kitchen does not look so dark. The kitchen table in the middle of the area makes it easy to prepare the meals. The light tone of brown is used in this kitchen so that it looks bright and warm. You can use the light brown tones instead of the dark ones if you are worried about your kitchen will look dark, just like this kitchen idea. The patterned kitchen walls and marble kitchen table make this area looks less boring. The hanging lamps also add the brightness. 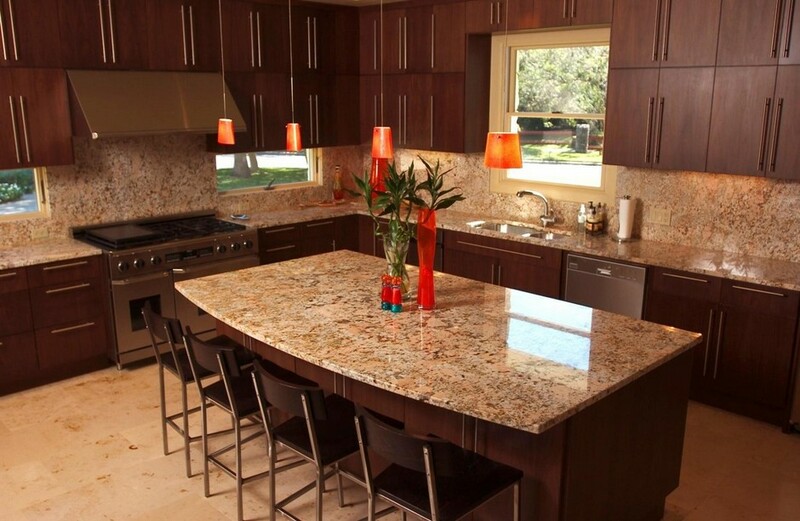 This kitchen only uses one brown tone, making it looks very simple yet stylish. A lot of kitchen cabinets are added in order to store the kitchen utensils and tableware so that the kitchen looks clean and neat without many utensils. The dining area is in the same place as the kitchen area, very practical if you do not want to bring the meal to another room. The householders also use the bar table for the dining table in order to make this area stylish. The white color from the fridge and blue color from the dining chairs add colors besides brown color. Greyish brown is able to be the alternative for you who are bored with the common brown tones and want the anti-mainstream one. 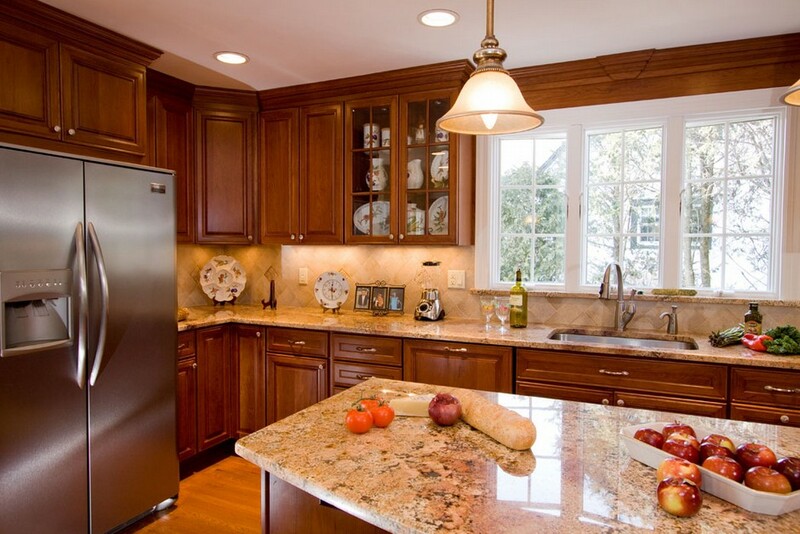 This brown tone is able to make your kitchen looks modern. The marble kitchen table and sophisticated kitchen utensils make the modern style in this kitchen look even stronger. The use of a lot of lamps put all the modern elements in this kitchen in the center of attention. And the placement of the mirror in this area is purposed to make it looks more spacious because the mirror will reflect the area. Even though brown is included in a neutral color, you can combine it with other neutral colors. 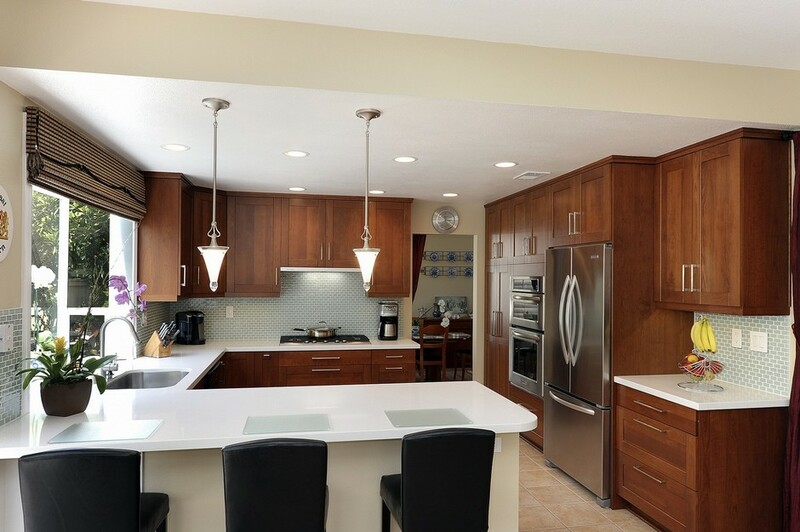 For example, this kitchen combines brown and white. The white color makes this are looks bright and clean. Moreover, the big glass window allows the natural sunlight come to this kitchen, adding its brightness. So that it will be really pleasing to have a breakfast in this area. Those 2 statement hanging lamps add an artsy and stylish touch. 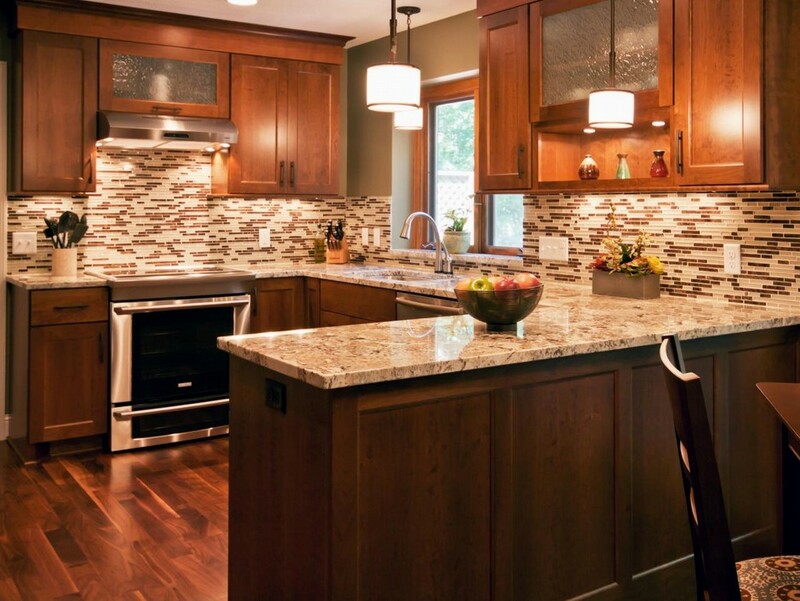 This idea combines many brown tones for one kitchen area. From the light tone for the kitchen floor, a middle tone for the kitchen cabinets, until the dark tone for the dining table. 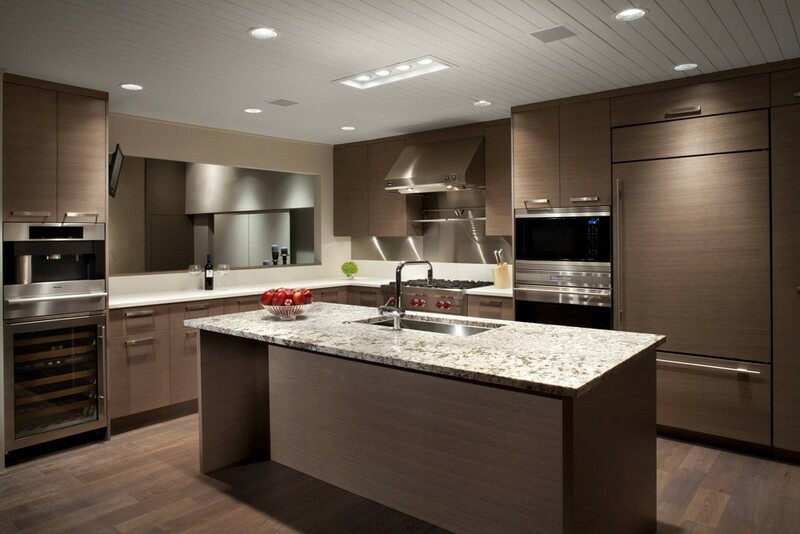 The wood material dominates this kitchen in order to get the natural brown color. The kitchen area and the dining area is divided with the bar table. Suitable for you who do not want a dining area to be exactly in the same as the kitchen area. The silky and shiny dark brown dining table brings a fancy look to this area. This idea is ideal for you who want to freely move in the kitchen. This kitchen is like an aisle, long and quite vast. It also has a lot of kitchen cabinets, allow the householders to make the kitchen clean by saving the tableware and kitchen tools inside the cabinets. The natural brown color from wood material matches perfectly with the black marble kitchen table. And the dim lights bring a little bit of elegance to this area. The light brown tone from the cabinets and brown marble kitchen table make this kitchen looks very rustic. Added by the classic hanging lamp. Storing the tableware in the windowed wall built-in cabinet is a great idea to instantly create a wall decoration. The householders also place the decorative dish to make the area looks more stylish. 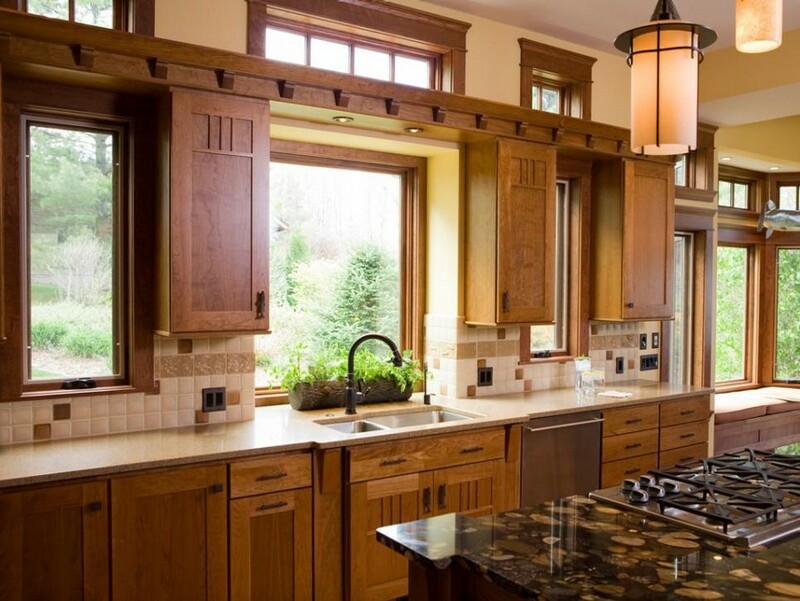 Moreover, the white French window only accentuates the rustic look in this kitchen. The stainless steel fridge cannot even ruin the look. 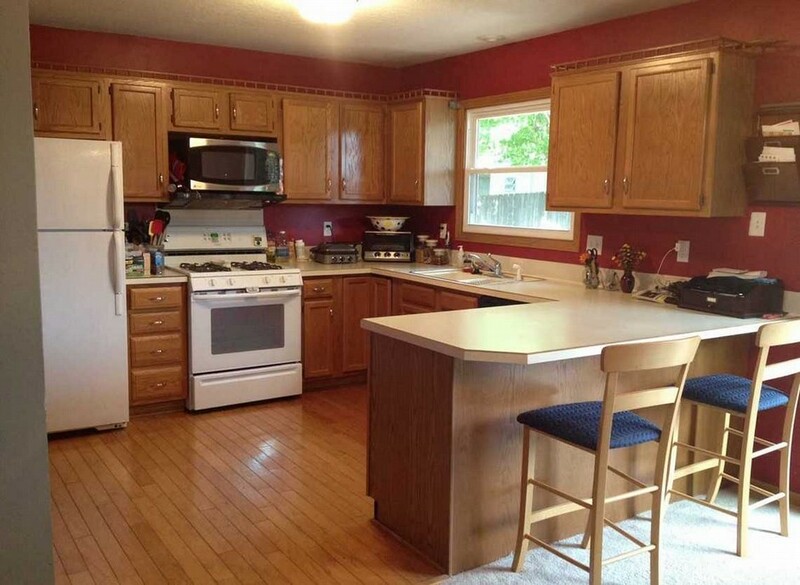 This kitchen looks very neat and clean, thanks to the neat arrangement of many wall built-in kitchen cabinets. The brown marble dining table is placed in the middle of the kitchen area and matched perfectly with the surrounding elements. The householders only use a little bit of stainless steel kitchen utensils so that it will not ruin or interrupt the metropolis style. As well as those unique hanging lamps, only add a unique atmosphere. 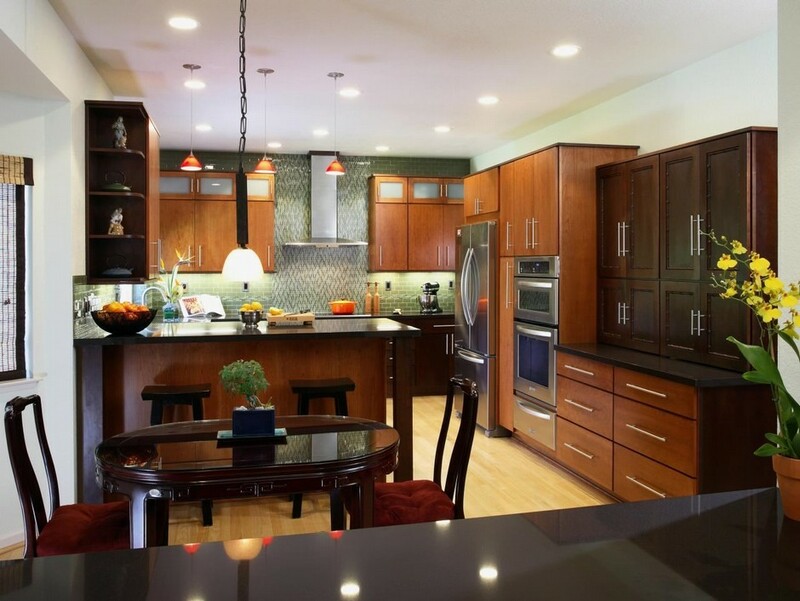 Looking at this brown kitchen idea will remind us of Japanese style. The model of the kitchen cabinets and the pop-up built-in cabinets are related to Japanese style. Moreover, look at the hanging lamp. In order to make the kitchen area looks more playful, the householders install the plaid patterned kitchen walls and choose a patterned marble kitchen table added by the built-in stove. Some of the middle-sized glass windows are also able to add brightness to the area. 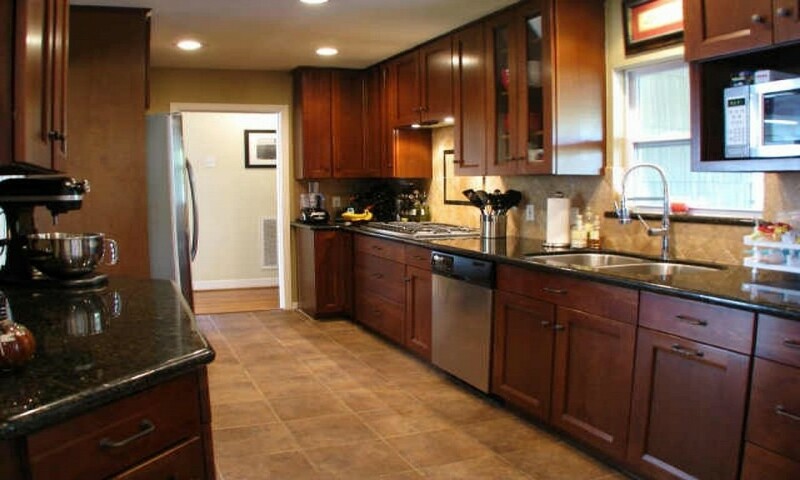 Brown is not easy to look dirty, making this color suitable to be applied in the kitchen area. Brown is able to be combined with any other colors and it is also able to create many styles and looks. Because this color is mostly obtained from wood material, brown is very suitable for you who is a lover of nature.